In this economic epoch of high unemployment and general uncertainty, many people are turning to the less-than-stable-but-better-than-nothing strategy of freelancing. It’s with good reason: freelancing is easier than ever these days. You can find projects from all over the world, deliver work to anyone with an email account, and accept payment without so much as having a credit card of your own. It’s a concept that’s finding new life in a smaller world. 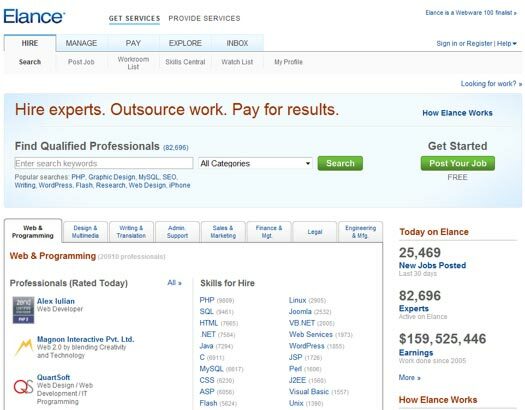 In that world towers Elance, (review) king of the jungle, boon to freelancers near and far. But while Elance is one solution to your personal economic woes, that doesn’t necessarily mean it’s the only solution. Blasphemy? Hardly. There are plenty of ways to find good money for honest work these days, whether you’re talking about in-person business or online transactions. For the purposes of this article, however, we’re talking online business: can you still get paid well by competing with outsourcing options in India, Malaysia, and the Philippines? And since so many sites want to attract all of these work providers and work buyers, let’s focus on these first. oDesk.com (see our oDesk review here) for one, makes no bones about what it’s for: it wants you to outsource to anyone and anywhere, across both political borders and commercial ones. It’s a web site for the 21st century, to be sure, but it does well by ranking up there with Elance in terms of crowdedness (a good thing) and general services provided. With a freelancing service, those features include basic necessities like handling financial transactions and allowing you to easily search through projects and bid on them as you please. Sure, it might cost a little bit to find work, but as the old saying goes, you have to spend money to make money. Guru.com (see our Guru review here) is another nice choice, and certainly worthy of mention along with Elance whenever you talk about the top freelancing sites out there. The idea is that you can find any sort of “guru” simply by posting your project up for bids and letting the experts take it from there. If you are a guru, then you’ve got a way to make money – by visiting their site. Guru makes a point of sorting projects by geography, so it can be a great way to make local contacts, as well. Freelancer.com (see our Freelancer review here) rounds out this portion of our list pretty easily by keeping things simple, cheap, and easy to handle. In fact, simply by signing up for an account at Freelancer you’ll be able to submit proposals for projects, allowing you to seek work without the initial hassle of entering your credit card information. If you’re looking for good money without the upfront charges, Freelancer might be a great place to start your Elance-free journey. Let’s get a little more focused. Let’s say you have a highly niche-worthy skill and wouldn’t mind finding a site that caters to your whims. Difficult, right? ScriptLance.com (review) is all about the programmin’, although it’s a little bit like a pizza joint that sells burgers, too: they don’t want to leave anyone out. While writers and designers can find work, it’s the programmers who will have the easiest time finding that “honest work” they’ve been looking for. GetaCoder.com (review) also makes no bones about connecting businesses with the programmers they so sorely need to get things done in this electronic world of ours. Programmers who want more substantial projects to resemble an income they might have with a “real” programming job should go here, because this is where they’ll find a lot of the meat and honest work that’s been so hard for others to find. Does the presence of these Elance alternatives mean you’ll want to abandon the king of the jungle? Of course not. But it helps to diversify yourself and never be too reliant on any one web site to make your economic world go ’round. Then again, relying on Elance sticking around might be safer than relying on your employer to be around in five years. Uncertain times indeed. This is a great collection of outsourcing links. I found myself often outsourcing a few years ago, but stopped because the quality was so low. I highly recommend keeping the following principle in mind when you outsource: You get what you pay for! I have work on odesk from 2008 and its good enough but now its messed up with scammers and middle men. Means, very few direct clients, most of the clients are like brokers. Great analysis of some of the other Elance alternatives out there. Thanks for putting this together! Elance is a bad joke, most of the offers for qualified jobs offer 10 times less they would pay a US consultant, that is far more in line with the kind of money you would earn flipping burgers. Do you know of any decent alternatives? Rui Ribeiro, have you tried any of the above alternatives like Guru, Freelancer or oDesk? All the same, gigs for 10 USD per hour or less does not make sense. To be fair freelancer is the best of the lost, just because it allows to filter easily the projects to say > 50 USD. I believe it was very good 1 or 2 years ago, now prices are becoming very low and also full of non-skilled people. Very hard to find right people. I like the Elance workflow a lot more than oDesk so I hope they don’t ruin it. Thank you for sharing this. I have been using Elance for quite a while now. I want to try oDesk to see which one is better.